Recently, I was at an event where one of the speakers shared a story about an event he spoke at where he wasn’t allowed to use slides during his talk. No big deal, right? Except this was two days before he was scheduled to speak to a room full of colleagues and mentors. And he had been preparing his slides and speech for weeks. The audience would have never known that he originally planned to have slides; the talk he gave was undoubtedly more powerful, interesting, and engaging than any slides could have been. This story is part of my inspiration for this week’s episode: What to do when your slides, for whatever reason, fail you. 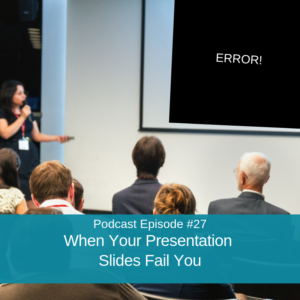 In this episode, I talk about how you can recover and move on if your slides fail in the middle of an event, why you might not need slides in the first place, and some creative alternatives to using slides. Sometimes slides can be distracting, and it’s rare that they bring you truly closer to your audience. Listen below – you might find that you’d like to craft a slide-free talk for a future event! How a speaker I recently met bounced back from being told last-minute that he couldn’t use slides – and then gave an even better presentation. Why slide-free talks are often the most powerful talks we can give. What to remember if you decide to bring a 3D version of your product as a backup or replacement for your slides. What steps you should take if your slides fail you due to tech problems, being forgotten at home, etc. A time I realized my slides were completely unnecessary and put people in small groups instead – to fabulous results. Creative ways to integrate pictures and other images into your talk without using slides. You are listening to the Speak So It Matters podcast, episode number 27. Welcome to Speak So It Matters where we share a mix of stories of inspiration and super practical public speaking and communication guidance to help you release all the barriers to becoming the speaker you know you’re meant to be. Some of us are called to use our voice to serve others and our world, as well as to become the most fully expressed version of ourselves. If that’s you, you’ve landed in the right place. Let’s do this, my friend. My speaker friends, hello to you. Today’s topic is going to serve you so well that it just makes me giddy. We’re building a bit on last week’s theme and getting kind of nitty gritty about it. We’re going to talk about what to do when your slides fail you and really a hint at the hidden gifts of speaking without slides at all. But first, I have to tell you something about this podcast. My friend Ken came over to pick up his daughter last week. Hey, Ken. And said, “I was listening to your podcast today. It sounds pretty good. What’s your setup?” And this is high praise from an audio expert, which Ken is. So, he starts walking toward my office and I was like, “Oh, geez. The curtain is about to get pulled on the wizard here.” I’m the wizard in this scenario. Pretty fun, right? So, I took him into my office, and I showed him my cute little setup with my microphone, my laptop, and that’s kind of pretty much it. I mean, honestly, the magic happens after I record through my amazing podcast tech team. He did seem kind of surprised at the simplicity of my setup. I’m sure I looked like such an amateur. Yet, I do hear pretty often how good we sound. Thank you, Pavel and team. And I get notes regularly from listeners who love what we’re doing. So, seems that sweet, simple, and not so fancy is working out. And for those of you who’ve asked me about podcasting, which is growing in numbers, I do hear from listeners regularly like, “Oh, I kind of want to start a podcast, too. I’d love to learn how you’re doing it.” They want more about behind the scenes, so I am working on a podcast to talk all about podcasting with you. After all, this too is public speaking, and it’s really a big avenue for public speaking now. All right, my friends. Let’s get into today’s topic because it’s such a good one. Do I always say that? This past weekend, I was at a conference in Portland. On the final day of the conference, one of the closing speakers started with this story. He said that he had arrived on Friday night and enjoyed the opening party at this conference. And when the festivities ended, all the speakers were asked to gather in a separate room to just kind of talk about the day’s events. This was his first time speaking at this kind of an event. He’s spoken at a lot of conferences in different industries, but it was the first time he was speaking at this event. Some of his mentors and people that he really respected were sharing the stage with him. So, he was excited and really felt honored to be a part of this. They have their speakers meeting, and then he’s walking to the elevator with the leader of the conference. He turns to her and says, “So, I have my slides. Where should I send those for my talk on Sunday?” She turned and looked at him confused and said, “Oh, we aren’t using slides at this event.” The speaker describes this slew of thoughts that came rushing in in that moment as he’s looking at her face. “Oh my gosh. This is never going to work. I can’t do this. I’m going to have to pull out. I’m going to have to tell her, ‘I’m so sorry I can’t deliver my talk. I had planned to use slides.’ This is going to be terrible. My mentors are going to think I’m stupid or whatever.” He just listed out all these thoughts that came to his mind that come to all of our minds when something like this happens. You know, they’re just the thoughts that just pile. It’s like this big flurry that comes out when we learn something of this nature, especially when we’re about to get on a stage and we’ve prepared so well. But then, over the next few days, luckily, he didn’t take any rash action and pull out of the event. He just said, “Okay, let me just give this a little bit of time and see if new ideas come to me about how I’m going to deliver the message that I had spent so much time crafting.” What he came up with absolutely blew my mind. I know that it was so delightful for the people in the audience. I could see it in their faces, and I don’t know. Just, my own reaction inside my body I know was an indicator of how it must have landed for so many of us in the room. Because the way he turned that experience into a powerful setup foundation for his talk was pretty cool. What he did is he, you know, he told us the whole story about how he had these slides created. He had spent those four weeks preparing this great talk. Then he said, “I realized I just needed to look at this in a new way.” He said, “I was sitting in the audience listening to other speakers speak on the first day of the conference.” Remember, he was going to speak the next day, so he had that full day to come up with new ideas. That’s the thing, in almost every circumstance, you don’t actually need your presentation slides to deliver an awesome talk. I’m not saying that slides aren’t awesome, They can be. A compelling image connected with just the right words, maybe a couple of words on the slide or just the image coupled with the words that you’re saying can be a really captivating combination. Images of your product or powerful displays of data done really well can help crystallize your point and motivate your audience. We do know that engaging multiple senses helps the audience engage with your content and can help them remember what you say. Yet, I can’t tell you how many clients I’ve had tell me, and I’ve had this experience myself multiple times, that the talks and presentations they deliver without slides are among the most powerful and connected talks they’ve ever delivered. Of course, like all other aspects of speaking so that it matters, it is all about how you handle it if your planned slides don’t end up working out as you had planned. Sometimes we plan the slides and we plan our talk with those slides as a central part of it, and if it doesn’t work, we do need to handle it, right? So, what should you do if your slides fail you? If you’ve created a whole presentation and it feels like your slides are important to your talk, yet you just can’t use them, the technology isn’t working, they broke down, you forgot them, they don’t allow slides at this event and you didn’t realize it, what do you do? That’s what we’re going to talk about. First of all, the key thing, the most important thing is it’s all about them. Remember that in all speaking, it’s all about your audience. So the number one thing you need to do is stay focused on them, on your audience. If they’re expecting slides, maybe because you’ve been using them and things went awry, or just because that was sort of promised or a normal part of the way this kind of content is delivered, then you want to tell them what happened. Don’t belabor it. Just tell them. Then, just let them know how you’re going to make this awesome anyway. What Steve Jobs did, which was a great strategy, he made a quick reference to the tech team. So, he clicked a few times. He kind of like looked out at the audience. There was a moment of slight discomfort. Then, he made some reference to the tech team. He’s like, “You know, the tech team in the back is like scrambling right now trying to resolve this.” Then, he went straight to telling a story, and it was a delightful story. He really gave himself over to the story, as I talked about in last week’s podcast about what to do if you “fail” onstage or experience a fail on stage. He told this story where he put his whole body into it and people loved it. Then, the tech got fixed, and he carried on with his presentation. So, that’s one example of what you can do. Another example is bring out a 3D version of your product if this is an option. You might even want to be thinking about this ahead of time. Maybe you’ve already got this planned, and you can just put the attention on that product. Or maybe it’s something that you have as a backup plan, right? Tech will fail you at times. What do you want to carry with you? You know, this isn’t relevant for everyone. There may not be a 3D product. But just as an example, I was at The World-Changing Women summit last year and Rahama Wright of Shea Yeleen, I hope I’m saying that right, passed around hand cream, which is one of the products for their company. She passed it around the room, and people put it on their skin and rubbed it around. You want to be careful, of course, about this kind of thing. We’ll do a whole ‘nother talk about this at some point. But when you’re passing around something with the audience, know that you’re going to lose their attention. So you definitely want to be very focused on what they’re experiencing right then. Talk about the cream. Talk about what it feels like on their hands, you know, that kind of thing, because that’s what they’re focusing on anyway. But you know, you have this option, slides, you know, the two-dimensional slides on a screen are just one way that you can further engage your audience through their senses, too. That’s just one example of how you can bring out your product and make it part of the experience. Again, maybe you’ve already got that built in along with the slides or you have something on backup where you could say, “You know what? It isn’t working to show you this way, but luckily I brought this.” Pull out the 3D version. Just remember, they have no idea what you had planned, so don’t apologize for something they don’t even know happened and wouldn’t care. You know, they don’t care that it didn’t happen because you’re giving them something else that just as well, and sometimes even better, illustrates your point or crystallizes their understanding of a concept or whatever. What the tendency to do is is to kind of want to say things to the audience about what just went awry. Remember, your audience has no idea what you had planned. They may not know that you planned on using slides at all. So unless you have a story at the beginning, like the speaker this past weekend where talking about that slide problem was really such a beautiful point, you may just not bring it up at all and just bring out your 3D item or have the audience engage with one another. Have them do an activity together instead. There are so many other ways that you can help illustrate a point or crystallize a concept that don’t have to do with the slides. Remember, they don’t know what you had planned. The point is always, did you serve them, right? If you just find a new way in that moment to serve them and if you can have that presence of mind that the slides are just … They’re not your presentation. You know, that’s one of the sort of jokes that I play in my mind whenever I have a speaking or training opportunity that I’m delivering on. I’ll be talking to the event or the organizational leader who’s bringing me in. They’ll say things like, “Can you send your presentation to us a week ahead of time or whatever?” I always think to myself, maybe I’ve said this before, “Well, not unless you send me a plane ticket.” I haven’t said it yet, but I keep saying I’m going to say that at some point. Hahaha. But the point is, the presentation lives in you. You are the one. You’re the information. You’re the presentation. Those are just your slides. And if you have that mindset about it, I think it will change everything about how you respond when those slides “fail” you. So the second thing, the first thing you want to do is stay focused on them. Remember, it’s all about them and serving them. The second is activate their minds and hearts in other ways. As I sat in the audience this weekend, my heart and mind were absolutely exploding as I listened to this story. I mean, partly that was because I’m a speaking coach and this is one of those totally awesome examples that I know I’ll share forever and ever, amen. I mean, I went up to him afterward and just told him how incredible I thought that was and how excited I am to share this example. He was so delighted to hear that it had such impact. He also could feel the power of what had happened as he realized that this even better way of expressing his ideas showed up for him. But, I was also just absolutely delighted heart and mind because the analogy he used was so perfect. That whole, “See that tree out that window,” all of it was really relevant to the point of his talk. Remember, that connection with your audience is the most important thing, especially if you want to influence their behavior or thinking. Of course, we only want to do this kind of influence persuasion for the good, and I know you’re always thinking of it that way, but people follow people they know, like, and trust. When you activate their hearts and minds in these ways where there’s not like a third element, think of it like it’s almost like a triangle. There’s you as the speaker, there’s your audience sitting across from you, and then over to the right or left, technically, depending on where your slides show up, are your slides. You’re creating kind of this triangulation. Again, sometimes that’s the right thing to do because it’s worth it overall, but it’s kind of amazing to realize how many times you might actually be better off just going straight between you and the audience and a slide fail can bring you there naturally, can give you that opportunity. Your slides can be a distraction, and it’s rare that slides put you closer to your audience. This one time when my sides didn’t work, I had the audience get into groups and brainstorm ideas instead. It was just one of those sort of like in-the-moment decisions I had to make. Okay, I was going to talk through how you think through this brainstorm and just kind of give them in high-level concept about how to do that. I thought, “Well, since I don’t have the slides and … ” You know, there was a series of slides. Mow I’m like, “Why did I ever have slides about that?” But see, that’s what I was taught by my “slide fail”. So, the audience got into groups. They were brainstorming ideas instead. Then eventually, they’re exchanging contact info so they could keep the conversation going. 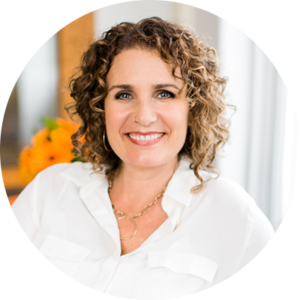 A lot of times when your audience is coming together around the topic that you have offered up in your talk, yes, they want that topic covered, but they’re also gathering for other reasons. They want to know each other. They want to be around other like-minded people. When you give them opportunities to interact, and sometimes a slide fail can encourage you to do that, you give them even more of what they came for. In this case, that wouldn’t have happened if my slides had worked. That’s my second suggestion to activate their minds and hearts in other ways. Then, I’ll give you a third idea that’s really kind of an extension of that one. But, I just love this one so much that I really want to highlight it. It is draw. Actually, instead of having these slides that are already pre-created, right? With the images on them. Because images are powerful. We know that the picture superiority effect is really valuable. That is a la Brain Rules, the book Brain Rules, which I love so much by John Medina. He talks about the picture superiority effect and how when we have an image that’s coupled with words we are far more likely to remember. It’s like in the 60-something percent to remember what was covered. So, it is valuable to have images. And if those images aren’t coming up on the slide, on the screen, draw some. There’s some really fun research on the benefits of drawing on a whiteboard or a chalkboard for audience engagement and lots of other things. Maybe you remember the story from last week about my colleague whose slides wouldn’t load on the tech system. She used a whiteboard, and it totally worked. There’s this cool website at the Yale Center for Teaching and Learning, we’ll put that in the show notes, where they talk about all the different ways that using a whiteboard is, that whiteboard or chalkboard, is valuable for teaching. You can use it for active engagement during discussion. You know you build the conversation in writing. If you write the agenda out ahead of time, you can kind of walk over to it and cross things off or add additional items as they come up. So, it’s just this sort of more active living document on the board for all of you to share to guide a really rich discussion, for example. We also know that our brain loves mystery. Again, John Medina Brain Rules is the place where I best understood that concept. Writing on a whiteboard actually evokes that mystery, right? Think about it. The writing begins, and you’re like, “Oh, what’s going to come up next?” Or if you start to draw an image, who knows how that image is going to turn out? You can use that to captivate attention and engage conversation in your audience. I also found this really cool website at Explanimate. Explanimate? We’ll put it in the show notes. But, they talk about all these reasons why those videos, those whiteboard videos where … They were really popular for a while. I still see them around where you actually watch the information and images build in this video on a whiteboard, right? It’s a video whiteboard process. They give some other reasons why those were so popular, but they say things like, “We like seeing a human hand.” Just as other humans watching, we like just seeing a human hand actually create things. That human connection. There’s the puzzle being solved before our eyes what I was talking about with, you know, how our brain loves mystery and watching that mystery unfold a la John Medina and Brain Rules. It also has that step-by-step feel. You kind of watch it happening over time. They talk about some other cool things on that website, so you might want to check it out. The truth is there are a few circumstances in which your slides are really essential to your impact. I bet there are even more in which you might create more powerful connection without them. Isn’t it cool to know that even when your slides so-called fail you, things can go really awesomely, like my new favorite speaker from this weekend. Who knows what kind of profound impact you’ll make? This is one of the awesome things about being a speaker. You know that I always want to help you get out there and share your message in the most powerful way possible as far and wide as possible because I know you’re out there sharing your beautiful voice for good. That’s why I created the Speak with Power and Grace Toolkit, and I want you to have it. 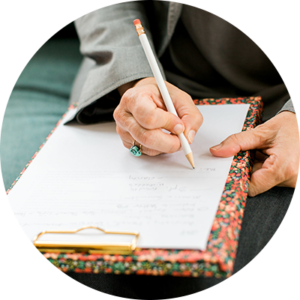 It includes all kinds of support for you, including the only presentation outline you’ll ever need. You can get access to that immediately at speaksoitmatters.com/yes. So there we have it, my friends, another week in the hopper. Is that the saying? I love being here with you. I always love being here with you. I just am so delighted thinking about you out there changing lives and making a difference with your message. Just never forget, you were made for this. I know because you know. Take good care. See you next week. Thanks for listening to this episode of Speak So It Matters podcast. If what you heard here today was useful, you’ll love the free guide I’ve created for you at speaksoitmatters.com/yes. Not only will you get immediate access to our Power and Grace Speakers Toolkit, including the only presentation outline you’ll ever need, but you’ll also receive weekly updates with our best resources as they’re created. I can’t wait to see you out there shining your beautiful light and changing lives with your message.